This is a sick book about a sick nation, sketched and written by a gifted artist. This is not fantasy fiction like A Games of Thrones by George R. R. Martin where knights and kings wage wars for the Iron Throne with the aid of dragons, magic, swords, and battleships. June 12 1993: Annulment by Abraham Oshoko is real and non-fictional. 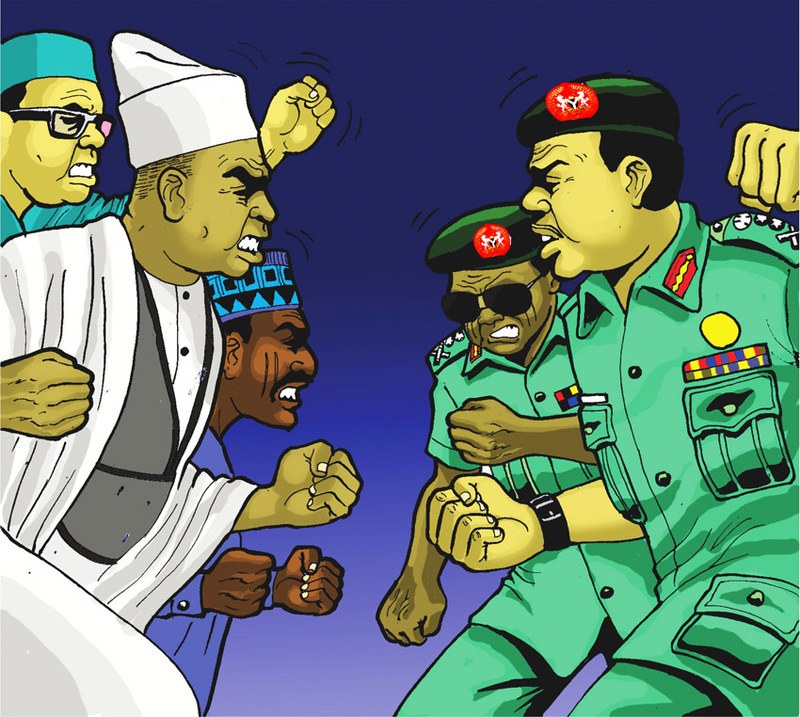 Nigerian politicians and military men are fighting for Aso Rock with billion naira bribes, revenue embezzlements, fraudulent lies, currency manipulations, character assassinations, and betrayal of friendships. If this is fiction, I would accuse Oshoko of being a very sick man, but these are historical facts, and they are ill. When copies of this book arrived at the Murtala Mohammed International Airport, they were intercepted by men of the State Security Service. The glossy paged graphic novel, designed in a comic book style, received an august reception fit for precious political arts. The SSS delayed distribution and deliberated over “seditious” comments in the book. They withheld five copies for their corporate enlightenment and failed to send us a review, but they permitted Kachifo to take delivery of the remaining copies of June 12. Why? The SSS are right about this: most Nigerians don’t read. 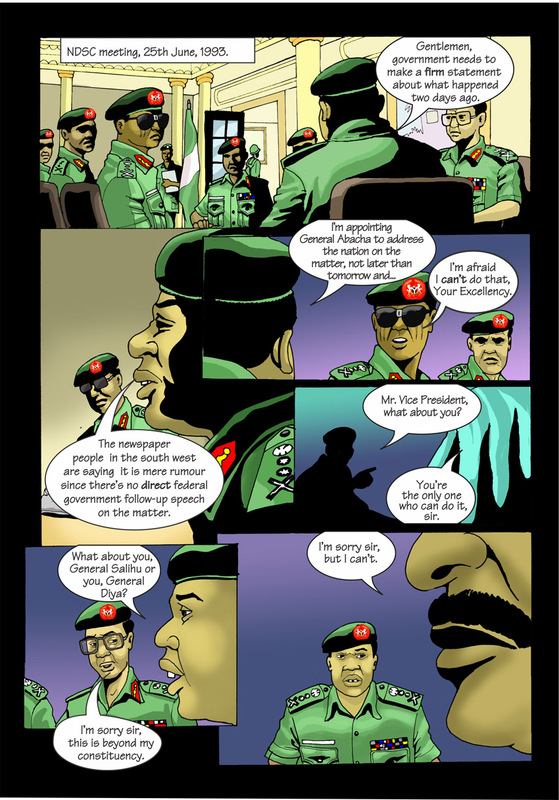 The secrets of Aso Rock are safely hidden in the coloured pages of June 12 1993: Annulment; confiscating the book is only going to drum up desired publicity for these classified pages. Quotes from political pundits and national players peppered the ten chapters of this book. The book covers the annulment days of June 21st -23rd 1993 to the Palace Coup days of November 15th – 18th 1993. 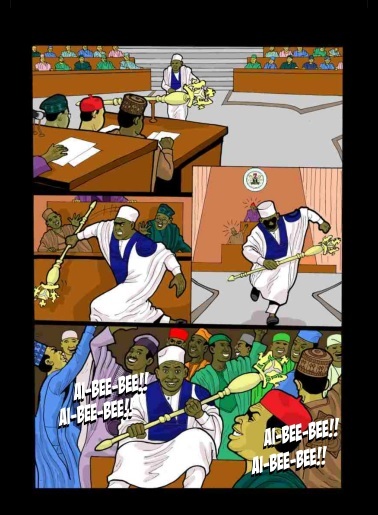 It is set in the following mental wards in Nigeria: Aso Rock, Aguda Guest House, MKO Abiola’s private jet and Ikeja mansion, Yar Adua’s compound, the National Assembly, Lagos State Governor’s Office, Dodan Barracks, Babangida’s mansion in Minna, and all other places where Nigeria is decided. June 12, 1993 is the manipulation of the people, by the people, and for the leaders. It is a struggle for federal power, the complicity of our royal fathers, and a record of the cash and carry politics of our political and military leaders. All the saints are villains, and all the bad guys are doing their best for Nigeria. June 12 is also an economic crisis. The book reveals the seventy kobo fuel price, before the crisis, and the 500% increment to five naira per litre after the June 12 debacle. June 12 is beyond a democratic struggle, the right of every citizen to sell their vote to the highest bidder, and the military hypocrisy about civilian corrupt practises. In Babangida’s speech about the reasons for his annulment of the June 12 elections, he claimed over 2.1 billion naira was spent by both political parties (founded and funded by him), and that he could not swear in a President that had encouraged the campaign of divide and rule…blah blah blah. The book reveals how the Central Bank of Nigeria was indebted to the bankrupted Nigeria National Petroleum Corporation (or verse versa), and the foreign reserve was depleted within weeks after June 12. Nigerians should read and remember the conspiratorial roles of Olusegun Obasanjo, Shehu Musa Yar Adua, Anthony Anenih, Ibrahim Babangida, Baba Gana Kingibe, David Mark, Arthur Nzeribe, Uche Chukwumereji, Ibrahim Dasuki, Ernest Shonekan, Sani Abacha, Joshua Dogonyaro, Oladipo Diya, and MKO Abiola, in an event known as June 12, which can be described as the sin of the nation. , KONGA.COM, and at Kachifo Limited: 253 Herbert Macaulay Way, Yaba, Lagos. Tel: 01-7406741, 0807 7364217. – Quintessence: Falomo Shopping Complex, Ikoyi. – The Hub Media Store: The Palms Shopping Mall, Lekki. – Patabah: Shop B18, Adeniran Ogunsanya Shopping Mall, Surulere. – The Booksellers Limited: Pan African University, LBS, Km 49 Lekki Expressway, Ajah. – Lanterna Bookstores: 13 Oko-Awo Close, off Adetokunbo Ademola Street, Victoria Island. – The Booksellers Limited: Ground Floor, City Plaza, opposite Biobak Restaurant, Rubuka Close, off Ahmadu Bello Way, Garki II. – Chapters Books Limited: F7 Omega Centre, Aminu Kano Crescent, Wuse II. – Charams Bookshop: 10 Shop 105, Gods Grace Plaza, Peter Odili Road, Trans Amadi, P/H. – Rainbow Bookshop: 20 Igbodo Street, Old G.R.A. – The Booksellers Limited: 52 Magazine Road, Jericho. Abraham Oshoko’s June 12 1993: Annulment so hot even Nigerian Authorities won’t let it go! On the 12th of June 2013, Kachifo Limited was scheduled to commence circulation of its latest publication, June 12, 1993 Annulment, by Abraham Oshoko, sequel to June 12, The Struggle for Power in Nigeria. The cargo containing the books arrived in Nigeria on Sunday, the 9th of June, 2013, and our staff went to the airport and with our clearing agents, commenced the necessary steps and clearance required before the books would be released. This was not to be, as after the Standard Organization of Nigeria had carried out their screening procedures, and the National Agency for Food and Drug Administration and Control, had ensured that the cargo contained no contraband and cleared the books. Then, just when we thought we could finally deliver the books to the waiting public, they were promptly seized by none other than the Nigerian State Security Service. Kachifo Limited staff were informed that clearance was being withheld to enable the State Security Service check the content of the book and ensure that the publication was not a “violence, anti-government book”. Annoying as this was, we have to say we did feel a little honoured that one of our publications was joining the honoured State Security Service roll. Really, doesn’t it have to be an important book to get blocked by SSS? As part of the clarification process by the State Security Service, the book would have to pass through a panel, set up by them, to go through its contents and ensure that it did not contain anything that would potentially spark unrest upon circulation. They also stated that this was an important measure for them due to the fragile political state of the country because, according to them, “June 12 was the root of Nigeria’s current political problems” (we withhold all comment on this but would really like to know what you think). The State Security Service then took 6 copies of the publication for review free – which were not returned even after the books had finally been cleared for release on Saturday, the 15th of July 2013. Staff of Kachifo Limited were on hand to receive them, after which the books were brought to our premises in Yaba, and circulation commenced. The sudden anxiety displayed by the State Security Service was surprising to us at Kachifo Limited because the first part of the multi-part series which was published in 2006 and has been in circulation since then has not caused unrest of any sort. Post script: Please tell us what you think our our post and of the June 12 event in general in the comments section below or via Facebook or on Twitter using the hastag #june121993 and we’ll reweet/like your post. Our Twitter handle is @farafinabooks or finds us on Facebook as Farafina Kachifo. Abraham Oshoko: Since I knew how to draw, I wanted to create my own stories just for the fun of being a ‘creator’! 1. When and how did you start writing and drawing? I started drawing very early. There was this bubble gum when I was little [5 or 6 years old?] it has a wrapper with illustrations of cowboys and Indians. I think that was the first thing that fascinated me. Writing came afterwards, when I came across Battle Picture Library, Commando comics, Marvel comics and so on. Since I knew how to draw, I wanted to create my own stories just for the fun of being a ‘creator’! It’s funny but I love being alone, creating things. 2. What training, if any, did you receive? I am self-trained although I did take some distant learning courses in cartooning. 3. Where do you draw your inspiration from? 4. Which creative process do you prefer, writing or drawing? It’s quite difficult to have a preference among two different but equally enjoyable creative processes. Writing is unique as you flesh out characters and create scenarios that never existed before [particularly if you are writing fiction]; but drawing is very unique in its own way also. 5. What else have you published besides the June 12 graphic novel series e.g. comics? I was with Pandora comics for a couple of years and also Kalabash magazine. My works featured in several newspapers and I also illustrate and design children books like Speaking Donkey, Oh! Poor Scorpion, Animal Naming Ceremony etc. 6. How do you go about realising your ideas? I begin by writing a synopsis [if I am writing fiction, but I read and do research work first if I am writing non-fiction] after which I write the plot and work out the characterization; then I script. It is after scripting that the processes of illustration [like thumb nailing, character design, penciling, inking etc.] takes place. 7. Do you write everyday? No, I don’t. if I write everyday, I won’t have the time to draw. What I do is writing for a period of time then drawing for a period of time. 8. Do you hole up in a study? Yes, I do. Creative works requires a high level of concentration and seclusion [at least for me]. 9. Do you exercise before writing or drawing? 10. Do you write and draw full time? Apart from teaching the Bible or teaching people how to draw, yes. I write and draw full time. 11. Would you tell us about the Profilix school of cartoon and graphic art? The Prolifix School of Cartoon and Graphic Art is an art school that covers that aspect of art and creativity that traditional art schools are not offering. Aspects like how to draw, cartooning, characterization, digital painting, animation, illustrating different genres, creative writing and so on. 12. How did it start? When I located the need and thought of how many years I had to learn on my own and how some of the existing traditional art schools are rigid and place too much emphasis on marks such that students tend to view art from a merely academic exercise instead of it being an expression of life. Also, when I realized a very powerful fact: EVERY ONE CAN LEARN HOW TO DRAW. THEY JUST NEED THE RIGHT TEACHER. 13. Where is it based? In my Art studio. 235A Idimu Road, Egbeda-Idimu. Everyone. Whether a student, a nursing mother, a banker, a career person etc. The only requirement you need is a serious desire to learn how to draw and the willingness to work hard at it. 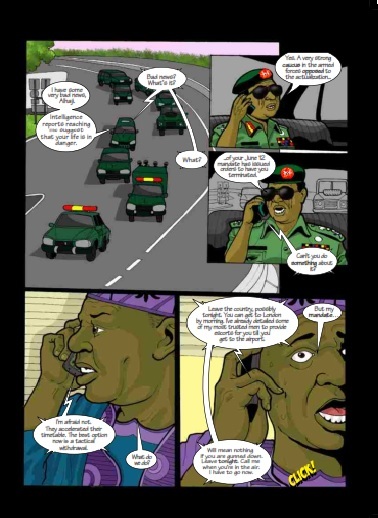 Abraham Oshoko, author and illustrator of the June 12 graphic novels talks about his newest addition to the June 12 series – June 12, 1993: Annulment and also what it means to be a graphic novelist. 1. What did you find most challenging in writing June 12: Annulment? The research…piecing together all the details from numerous sources. 2. Was June 12: Annulment easier to write than the first June 12? Yes and No. Yes because I have researched and done something like this before (even though there were differences in conceptualisation) and no because the style of this new volume is different from the initial one. Let me explain. The first book (being the first one), shifted between prose and reportage. It was like that because it was my first time and the amount of information gathered during the research work was so staggering that it was difficult to decide how much information should come in and how it should be presented. Should it be prose, documentary, poetry, comedy or tragicomedy? However, for this new book, I settled for prose. I thought; why not tell the story from the perspective of each of the players? Also, why not turn the players themselves into actual characters so that even though the story is non-fiction, it could be told in a way that will be appealing and yet intriguing to the reader without compromising the truth? So you have a story that takes us into the reasoning of Sani Abacha on why he really believed it was his ‘turn’ to be head of state; or why IBB felt he had no choice but to go along with the annulment or why MKO stood his ground that he won an election and therefore he has to rule etc. By gathering books, journals and articles written by all sides of the controversy. So there were books written by people close to Babangida, MKO, reports of eyewitness meetings with Abacha, Shonekan and so on. There were also personal interviews from most of the leading figures of that era. After this, the facts have to be cross checked with other research materials. It was records from news magazines like Tell, The News, Newswatch, African Concord etc. that strengthened the chronological order in the graphic novel. 4. Why did the June 12 elections stand out for you, after all there were other elections that were sabotaged in one way or the other? It was the first time in Nigerian history as a nation that an election was held that was free and fair and free of electoral violence and malpractice. This is also the view of all the members of the Nigerian Electoral Monitoring Group and all the international observers from several foreign countries. So it was a monumental event that should be recorded properly. 5. Did you feel that you were objective when writing June 12? Yes. The goal was to avoid writing propaganda and faithfully chronicle the Nigerian history so that posterity would have an accurate history as much as possible. MKO Abiola was not spared in the book. People who were close to him spoke freely of his shortcomings as a person and as a leader; events surrounding him were depicted the way they actually happened. Babangida was not spared either but he wasn’t also unduly victimized. The truth was told according to what really happened by piecing together all parts of the puzzle and fitting them together to give us the whole picture. 6. What message would you like your readers to take from June 12: Annulment? We need to be highly informed about our past and soberly draw lessons from it as we decide where we intend to go as a nation and as individuals from henceforth. 7. Do you write the story first and then draw the graphics or do the graphics come first for you? Of course I have to write first. After researching different materials, collation is done and then plot is built after which I write the script. It is after this that the process of illustrating begins. 8. What would you say were the differences between a graphic novel and a comic? Apart from the volume (comics are regularly 22 to 25 pages; in other words, a single graphic novel chapter), graphic novels are more mature. Comics may be for children but graphic novels (being actually novels but in illustrated format) definitely have a wider appeal. 9. Your portrayal of Babangida and the complexities of his position is really in-depth. Would you say he is the main character of June 12? I wouldn’t say he is the main character as there are three main characters – Abiola, Babangida and Abacha and there are several supporting characters like Shehu Yar’Adua, General Obasanjo, Ernest Shonekan, Omo Omoruyi, Beko Ransome Kuti on the side of the activists and so on. 10. What would your advice to other writers and graphic designers be? Keep at it. You learn to write or draw by actually doing it. Also, take some time off to study and enjoy the works of other gifted minds! Upon release, JUNE 12, 1993: THE ANNULMENT will be available in all major bookstores across the country. June 12 1993: Annulment is a fascinating window into the events that took place after and as a result of the June 12 elections. 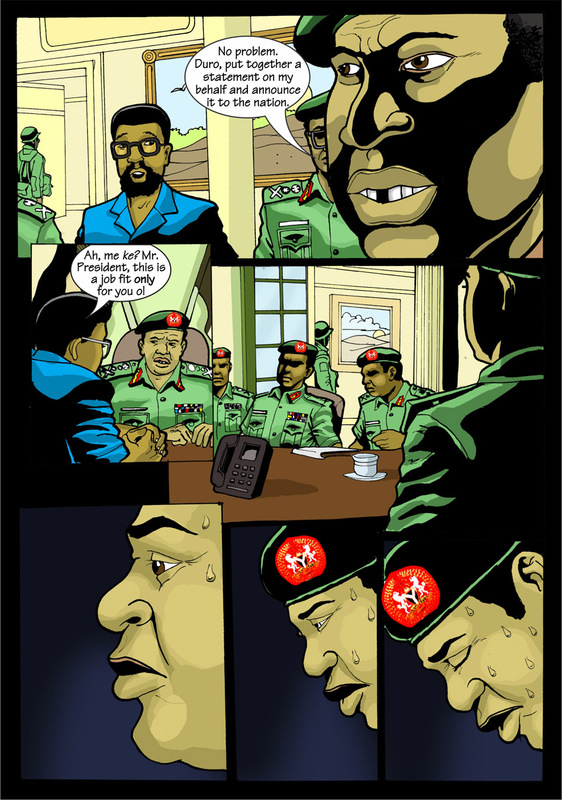 Farafina looks forward to picking the brains of the man behind the graphic novel. JUNE 12 1993: ANNULMENT is the second in this multi-volume series by Abraham Oshoko.